Hope you all had a great holiday. 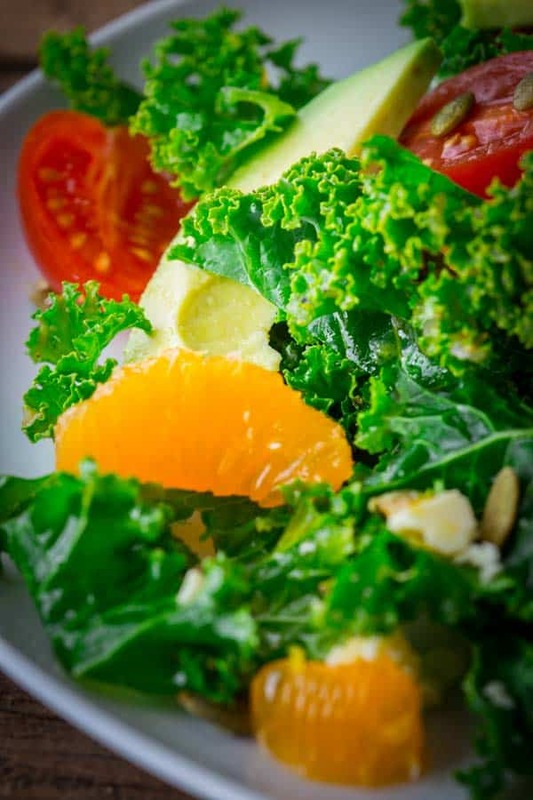 Today I have a healthy kale salad with clementines and lemon dressing. It is bursting with citrus flavor, feta and pumpkin seeds and has creamy avocado making it a delicious seasonal winter salad. It is naturally sugar free and gluten free and I got it from the Sugar Free Mom cookbook. Great news! I am giving a way a copy right here today. Let it be known, that around these parts, the year 2015 is going to be the year of the salad. I have already started a new Pinterest Board called Eat Leafy Greens Every Day. Automatically, my mind goes to salad when I think of leafy greens. But I am also going to be going for the green smoothies too, soups and more. I know I know, this sounds a lot like a New Years resolution. And I’ve said many times that I am not really a fan of them. But in this case I am creating a loophole. I am thinking of it as a goal, not a law. More of a fun healthy food dork plan, not a sentence. If I don’t eat them every day, that’s okay, but it sure is not going to hurt me to try. And I don’t really worry that by focusing on getting nutrient dense greens into my diet and onto the family table that I am going to go off on some junk food binge in backlash. I am just trying to be more cognizant of adding them in. I’m thinking of it as a journey toward more greens in my life. Sort of like how in this past year, we have really worked to become more aware of our added sugars. We’re still working on it, but this focus has changed some of our habits around the Webster household. I no longer add sugar to my morning cup of joe. And Jase switched from a Clif Bar to a Kind bar for his morning grab and run breakfast. I continue to work with my girls on ways to limit their added sugars without making them feel deprived or creating some sort of disordered view of sugars, which will really be important when they are older. So when my friend Brenda Bennett of SugarFreeMom.com told me she was coming out with a cookbook of family friendly recipes without white sugar I knew I had to get a copy. She sent over an e-copy for me to check out. 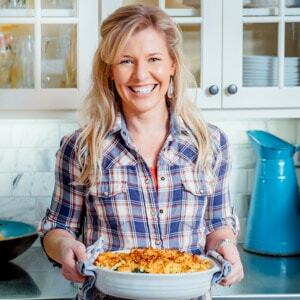 The book is filled with family friendly recipes that she created without any white sugar at all. To sweeten the recipes, Brenda calls for stevia and alternative less refined sugars such as sucanat, honey and palm sugar. She uses these less-refined sugars when cooking for her family and gives options in the recipes (for example she will call for a measurement of stevia or honey in her recipes.) 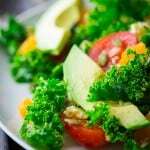 She has also recently discovered that she doesn’t tolerate gluten, and has eliminated it from her diet, so most of the recipes are completely gluten-free too. Today I am sharing a recipe from the book and giving away a copy of the cookbook too. 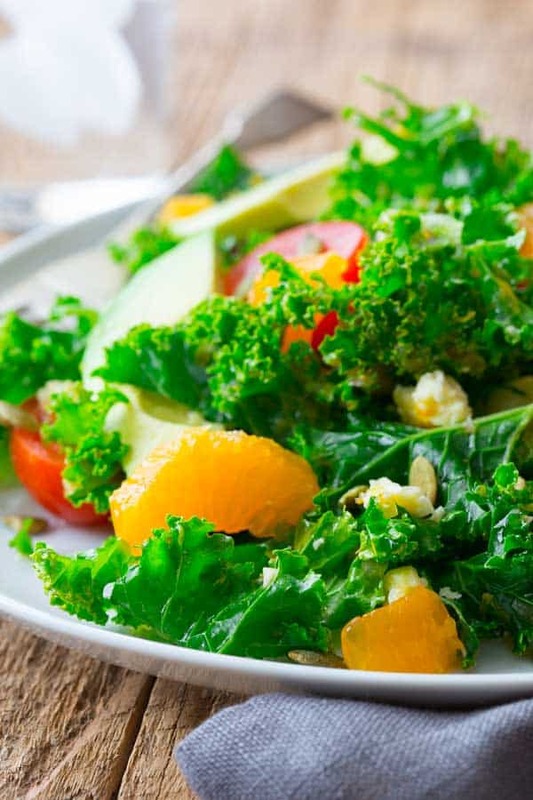 I picked this delicious citrus kale salad because of my greens, greens and more greens kick. I love how it has yummy winter ingredients in it, like lemon, clementines and avocado. The lemony dressing is super tart and yummy. I have to admit I ate the whole entire salad myself and didn’t share. Yes I ate 4 cup of raw kale. I am a freak( maybe it won’t be so hard for me to get in my greens every day afterall) and this salad was really good, and I just had to. 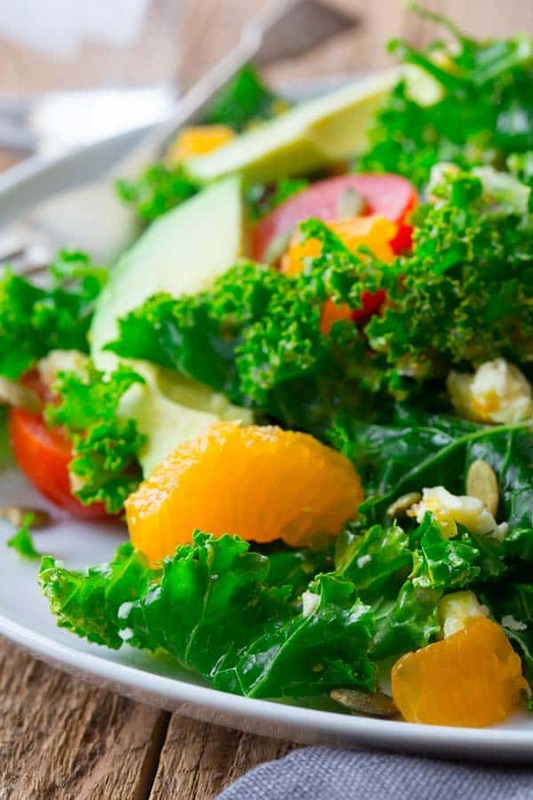 Sugar Free recipe for Kale salad with Citrus, feta, Avocado and Pumpkin Seeds from the Sugar Free Mom cookbook. It is naturally gluten-free. 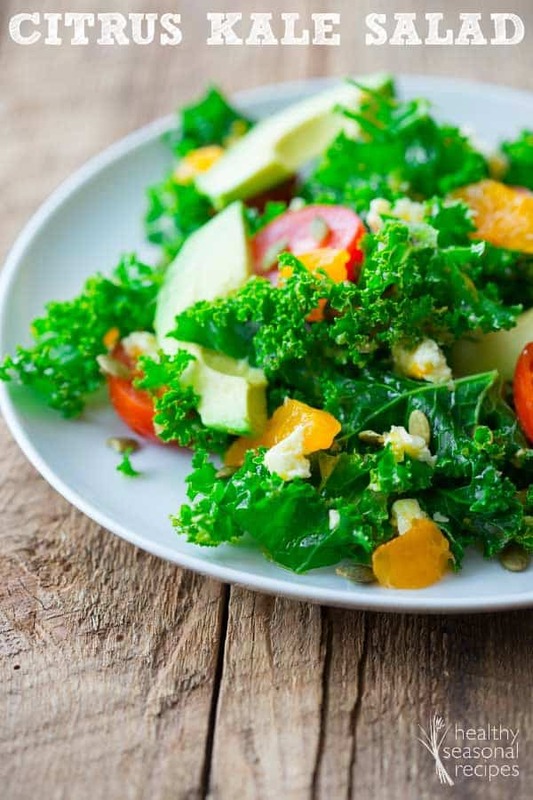 Arrange kale, clementine, avocado, cherry tomatoes, feta and pumpkin seeds in a salad bowl. Combine lemon juice and zest, clementine zest and juice, olive oil, shallot, salt and pepper in a jar. Cover and shake to combine. Pour dressing over the salad and gently toss to coat. Thank you for the wonderful review Katie! 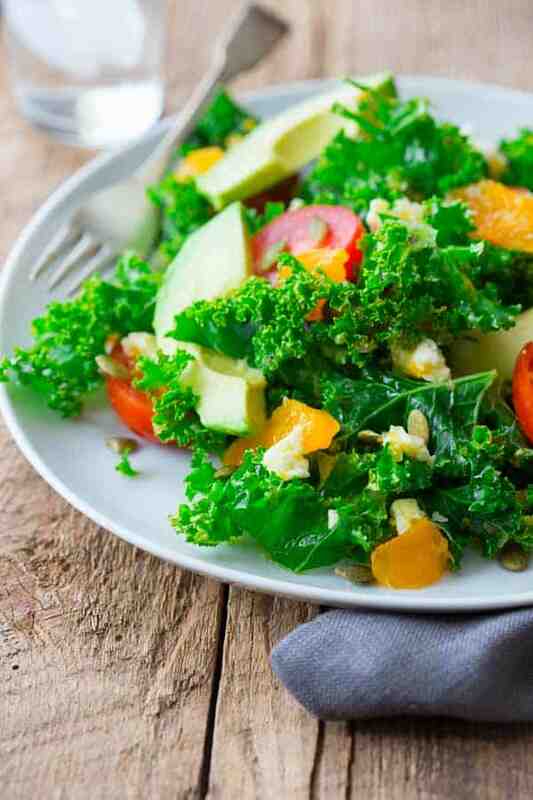 So happy you loved that salad, it’s a favorite for me as well!And thank you for help in spreading the message that food still tastes fabulous even when you remove added sugars! Here’s to a super healthy New Year! Thank you so much for the review copy Brenda! You must be so happy to have it out there, after all your hard work putting it together.I am glad to do a review. 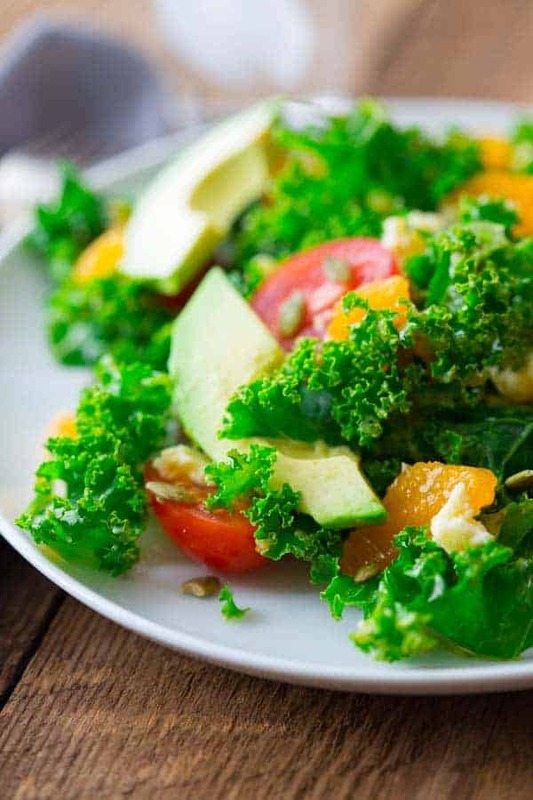 This is a beautiful salad for some fresh light eating! I don’t have any dietary goals except to just maintain my whole healthy eating as usual! Rebecca, thank you so much, and I think that’s a great goal! My goal is to get back on track and be a positive influence for the rest of the family! That is a great motivator isn’t it? Great plan Marla. Ha! I have been feeling that way these past few days too Farrah. Delightful! Something I exactly want after all the holiday cookies and sweets. I want to tame my sweet tooth and cut back on sugar so I am starting now! The holiday sweets can be such a slippery slope can’t they? I think that’s a solid plan Paige. Looking forward to bringing even more health and happiness to my family in the coming year. I love that one Pamela. I am so in agreement! This is the perfect salad to make after the indulgent Christmas I just had. thanks for the recipe! Totally with you Thalia. I am needing much kale in my life for days and days. 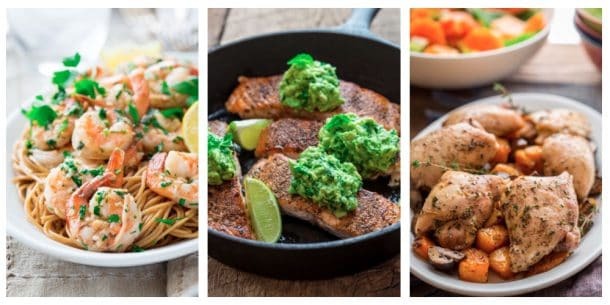 I have a crazy schedule with 2 jobs so I want to try and do better with menu planning for healthier meals. That’s a lot of work, so I totally commend you on that goal Lynn. 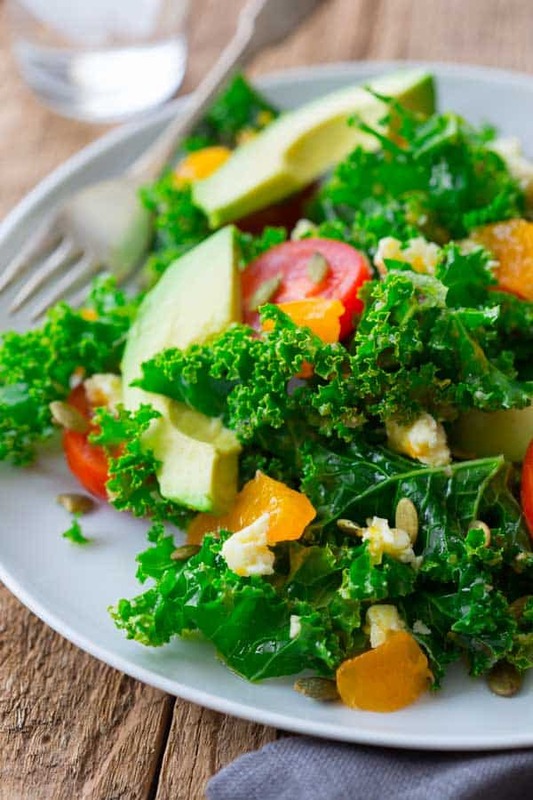 I am super obsessed with kale right now! I can’t go a day without it! This looks like a tasty lunch with an addition of protein! Thanks for sharing! I agree. That is totally my kind of lunch. This looks so amazing. 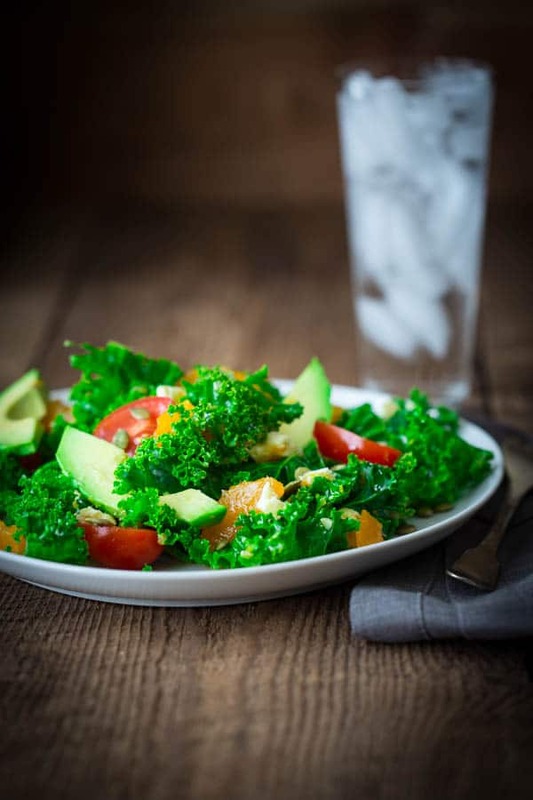 I am a big lover of kale in my green juices and smoothies as well as kale chips! We are having this tonight, can’t wait! I am obsessed about kale right now myself. I love the chips as well. My goal for eating more healthy in 2015 is to reduce the sugar I consume.